My wife and I regularly attend the Sunday morning Children’s Mass in our parish. During the homily, the priest invites the children to sit on the steps just below the altar, while he delivers a brief sermon prepared especially for them. During the Consecration, the most solemn part of the Mass, the children are summoned once again, and stand behind the altar on either side of the priest. Most of them appear to be between the ages of five and eleven. They behave pretty well, but are easily distracted. They fidget nervously, talk occasionally, and sometimes wave to their parents. Hine, a schoolteacher just prior to starting his 10-year journey to expose child labor, cared about the children as people, not simply as useful tools of persuasion. After all, his mission was to show that they were being exploited as tools of industry. Hine truly believed that their lives mattered. His respectful, empathetic pictures are evidence of that. After his assignment for the National Child Labor Committee ended, his subsequent photographs continued to demonstrate that same principle, that every person is important and worthy of respect. His first serious photography project, which he worked on in 1905 while teaching at the Ethical Culture School in New York City, was to take pictures of immigrants arriving and being processed at Ellis Island. He was aware of the already famous photographs of Jacob Riis, who had exposed brutal living conditions for immigrants in New York City tenements, in his 1890 book titled How the Other Half Lives. But Hine disliked the unsympathetic way Riis portrayed his subjects, believing that it perpetuated the widely held view that immigrants were hopeless victims, undesirable, and unworthy of respect. At Ellis Island, Hine instead gave us beautiful images of earnest and hopeful people who were worth caring about. From the very beginning of my work on the child labor photographs, I have been guided by Hine’s ethic, and by my former pastor, Rev. Eugene Honan, now retired. At each Mass, he would say these powerful and comforting words to the congregation: “Your life matters. You matter.” I asked him once why he chose to do this. 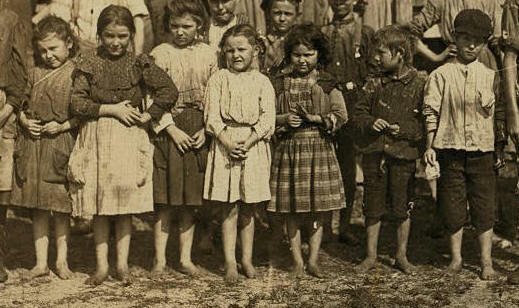 The lives of the children in his child labor photographs mattered to Lewis Hine. They still matter, and I believe these children deserve to be remembered. Tifton Cotton Mill, Tifton, Georgia, January 22, 1909. Photo by Lewis Hine. 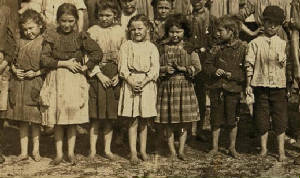 In the front row, children of the Catherine Young family: Mary (far left), Mattie (third from left), Eddie Lou (fifth from left), Elzy (sixth from left), and Alex (far right). The other two children, not members of the Young family, have never been identified. The story of the Catherine Young family appears on this site. Just click on the picture above, or click on the link to the story on my Lewis Hine Project home page. You can also find it on the link to all my child labor stories, also on the home page.